Description: HA13 on a reverse move at Bethlehem. 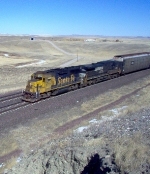 Description: NS 143 heads south on the Marion Branch just south of CP-79. Description: Crossing the bridge in Allentown's Canal Park. Description: NS 123 departs Oakville in the background and is about to pass through Springport on the New Castle District. Description: 123 heads south on the NS New Castle District just south of Oakville where they just picked up around 40 loads of grain from the elavador in the backgorund. Description: NS 123 just pulled around 40 loads of grain from the elavador in the background at Oakville on the New Castle District. Title: NS 20G @ 0911 hrs.